Posted on Friday, May 13th, 2011 at 6:00 pm. Due to limited seat availability, Please RSVP. Doors Open at 6:15 PM. FREE, but ticket required. Since its foundation, the Taiwan Music Culture International Association (TMC) has dedicated itself to the promotion of Taiwanese music abroad. 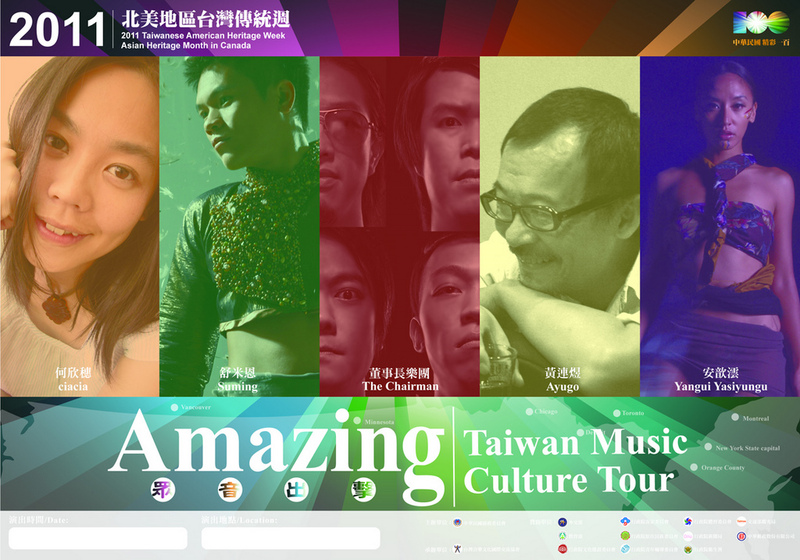 Each year, TMC recommends outstanding bands to share Taiwanese culture overseas. This year, for the North American Tour celebrating Taiwanese American Heritage Week, the Association selected a popular and renowned group that consists of The Chairman, Hakka King Ayugo Huang, Aboriginal singers Suming Rupi and Yangui Yasiyungu, and the Talented Ciacia Ho. This cultural tour will increase international awareness of Taiwan’s contribution in musical arts. Thank you so much for posting the info of Chicago’s TAHW 2011. The group of pop singers/songwriters were terrific, not only in how they sang and the music they wrote, also in the ways they presented each one’s own heritage. They were so well-liked that they had to give three encores. To Ho Chie Tsai: Thanks for posting Chicago’s 2011 TAHW. Really appreciative.